Earlier this month saw Revolution Pro (Rev Pro) Wrestling present their High Stakes 2019 event. The show took place from the world famous York Hall in Bethnal Green, London. The main event featured an independent dream match with NEVER Openweight Champion Will Ospreay facing Dragon Gate star PAC. The match featured a run in from CCK’s Chris Brookes and Jon Gresham. The bout ended in a time limit draw, with the contest going the allocated 30 minutes. PAC took to the top rope and counted along with the fans in the final seconds, opting not to hit his Black Arrow finishing move. The contest was a critical hit with fans in attendance but many were questioning the finish, blaming ‘politics’ between New Japan and Dragon Gate. Rev Pro has now announced that Ospreay and PAC will be teaming to take on CCK. The company will be heading to the Hilton New York Midtown Ballroom this WrestleMania weekend on Friday 5th April. Tickets for the show are available to purchase now. 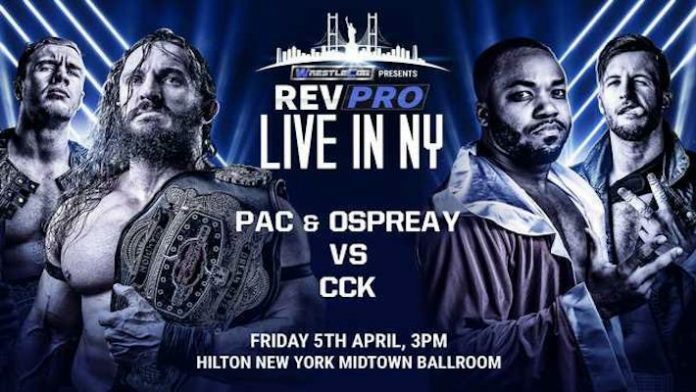 There were rumors that Ospreay and PAC would be involved at the New York showing following their time limit draw. Initial reports indicated that it would be another singles match however CCK’s involvement in the original bout makes much more sense. Can they co-exist? Can Ospreay finally earn the respect of one of his heroes? Can CCK spoil the party? Find out Friday April 5th, 3pm!